Hero, your trombone is your greatest ally. Treat it well. Moisture from your breath eventually builds up inside your trombone. When you need to empty it, you will hear a gurgling sound when you play. The slide needs to be lubricated. The slide is out of alignment because the inner slide has been bent. If your slide is dented or out of alignment, take it to an instrument repair shop. If your slide needs to be lubricated, you will need to apply slide oil or slide cream. There are many ways to lubricate your slide. For someone just starting their journey, oil may be the simplest. Ask your teacher what they recommend. To oil your trombone slide, first you need to wipe your slide clean. Very carefully remove the outer slide and set it on a flat surface where it will be safe. Don't lean it against a wall! Carefully wipe both sides of your inner slide with a towel or soft cloth. The inner slide of your trombone is extremely fragile. Be careful not to put any pressure on it because it can easily bend. Bending it will mean you will need to have it repaired for it to work properly. At the end of your inner slide is a place where the tubing gets slightly bigger. 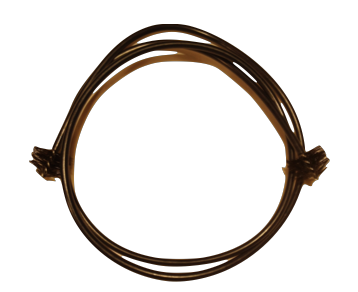 This is called the "stocking". Apply just a couple of drops to oil to each stocking. Carefully put your inner slide back into the outer slide. Make sure your spit valve is on the bottom! Move your slide in and out to spread the oil around. There are many ways to lubricate your slide. Slide cream is preferred by many trombonists, but requires your slide to be cleaned more often. Ask your teacher what they recommend. Before putting cream on your trombone slide, first you need to wipe your slide clean. At the end of your inner slide is a place where the tubing gets slightly bigger. This is called the "stocking". Put just a small amount of the cream on your index finger and put it on the one of the stockings. Gently rub this over the entire slide. Repeat for the other slide. Move your slide in and out to spread the cream around. Open your slide to slightly past sixth position so you can see part of the stocking. Spray the stocking with water from a spray bottle and move the slide in and out again to disperse the water. Carefully disassemble your trombone into the outer slide, inner slide, bell section, and tuning slide. Put a towel or rubber mat on the bottom of your bathtub and fill the tub with about 4 inches of lukewarm water and a little of the dish soap. 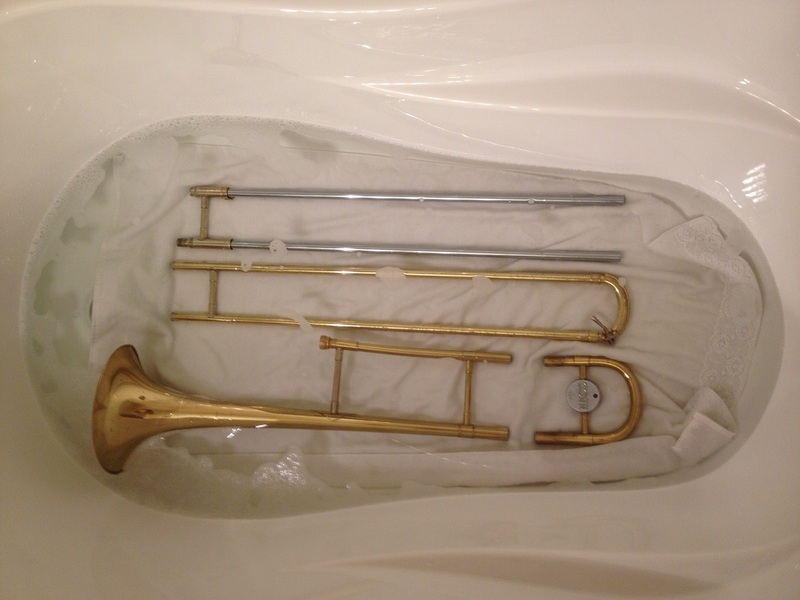 Place the parts of your trombone in the tub (on the towel or rubber mat). Clean the bell section and tuning slide by putting a little bit of soap inside each and running the cleaning snake through. Don't force the snake through any curves. It might get stuck! 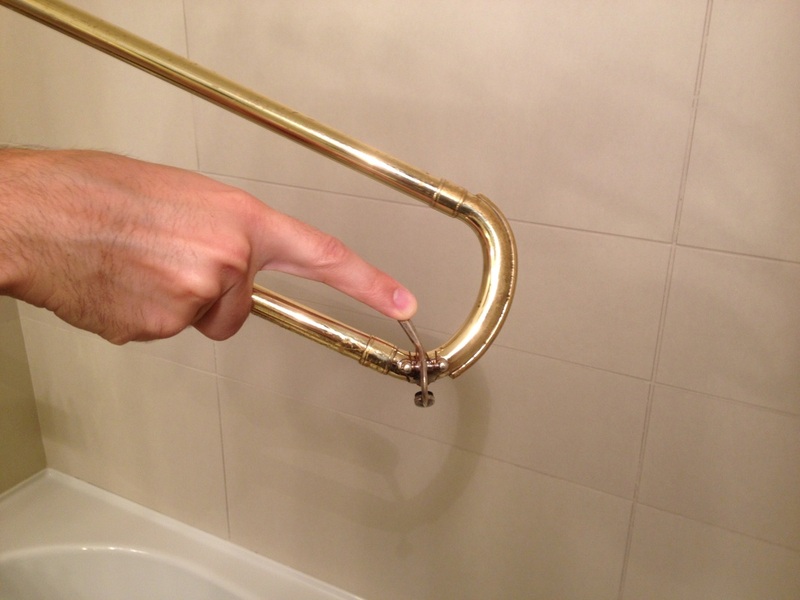 When you are done, rinse the bell section and tuning slide with water from the tub. Set them both aside on a dry towel somewhere safe. Put your slide back together. Place a little bit of soap in both of the openings and run the snake up and down on each side a few times. Don't try to push the snake around the curve at the bottom! Rinse out the inside of the slide by running water through it. Take out your inner slide and carefully set your outer slide back in the tub. Put some soap on a wash cloth and very gently clean the outside of the inner slide. Rinse with water and set aside on a dry towel. Get your cheesecloth and cleaning rod. Insert one end of the strip of cheesecloth into the eyelet at the end of the rod. Wrap some cloth around the tip and then pull the cloth so that it covers most of the rod. Giving it a twist will help to wrap it around evenly. Run the cleaning rod (and cloth) through both tubes on your outer slide. If it is very difficult to put in, you are using too much cloth. Do not push it all the way to the bottom. Rinse out the outer slide. Place your outer slide on a dry towel with the rest of your trombone. Gently use a towel to dry off all of the parts of your trombone. 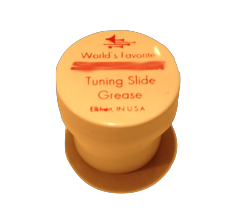 Apply just a small bit of tuning slide grease to the feet of your tuning slide and insert the tuning slide back into your bell section. Clean out your mouthpiece with the mouthpiece brush, soap, and water. Apply oil or cream to your slide (see section above). You have finished cleaning your trombone!